On Sunday I found myself at 7-11 buying cat food, because that’s what happens when you forget to stock up at the grocery store and then find yourself in the throes of a Meowing Emergency State. I’ve been trying to cut way back on my soda consumption, so of course I made the mistake of looking at the beverage coolers. My eyes were drawn, as they so often are, to the most x-treme ‘90s looking stuff in the case. The black-and-white photos on the labels looked awfully familiar. Sure enough, a closer look revealed a familiar name: Jones. Jones Soda is a smallish soda company based out of Seattle, known for unusual flavors (approach their holiday packs with caution) and featuring customer-submitted photos on their labels. In my preteen and early teen years, a bottle of Jones was a regular treat on nights my brother and I spent with our dad. I have particularly vivid memories of selecting a flavor and suitably cool label picture on our runs to the supermarket on the way home. I have Ideas about kids of divorce and our weird food attachments, but that will be for a later entry. Anyway, Jones has been tapped by 7-11 for a line of store-brand sodas. There are five flavors, including unusual-in-the-U.S. fruits like lilikoi and rambutan. I bought them all, because I have no self-control. In my defense, I brought them to a Fiasco session that night to share with friends, thinking a group taste test would be fun. However, my friends are smarter than I am and drank almost none of the soda, leaving me to play Drink Roulette while stabbing everyone in the back and getting off almost scot-free. Jones Soda makes you a character in a Coen brothers movie; pass it on. This past week and a half has been a rough cross-section of adulthood for me. The sewage system in my apartment complex decided to back up spontaneously, with the nearest point of exit being the bathroom in my garden apartment. This required me to evacuate first to a motel where I could swear I heard violins in the shower, then out to the suburbs to stay with endlessly patient friends and spend all week panicking about landing more writing jobs and not being broke. It was in this frame of mind, unknowingly longing for a bit of childhood regression, that I stumbled into Walgreens to buy wine they didn’t have (because Naperville), and found this treasure in the refrigerated beverage case. Is it just a sweet, sweet fantasy? 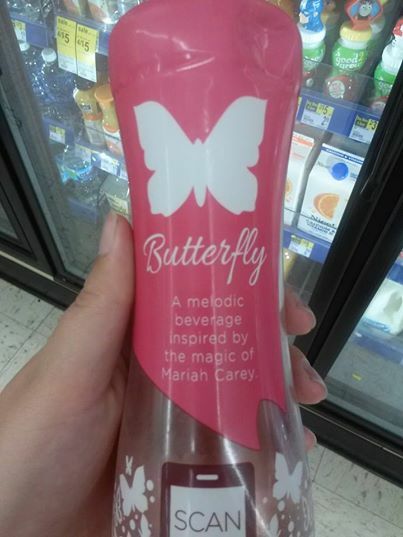 Yes, Mariah Carey has launched her own beverage, described as “interactive” and “melodic.” The latter adjective in particular concerned me, but apparently it means you can scan the bottle with your smartphone to get access to bonus content. I didn’t bother, because the anachronism whiplash was already hurting my neck. You see, despite its trappings of modernity, I can only describe this drink as tasting like 1998, the year I listened to its namesake album on cassette until it started to wear out. How can a drink taste like a year, you ask? As it turns out, 1998 was also a banner year for marketing perfumes and cosmetics to preteen girls, and as I turned 11 that year, I was deeply familiar with that aisle of Rite Aid. Those of you who remember, say, the Bottled Emotion perfumes Bonne Bell made will find yourselves thrown back into your awkward stage at warp speed. To come at this with more food-appropriate vocabulary, Butterfly tastes strongly of grape and melon, but in an offputting, artificial way. Those of you who have ever eaten those lychee jelly cups that pose a delicious choking hazard may also notice a resemblance. As an olfactory sensation, it brings back intense memories of a time when things were more carefree and potential seemed limitless. And yes, I have been listening to the Butterfly album for the first time in probably 15 years while writing this post. Thank you, Spotify.